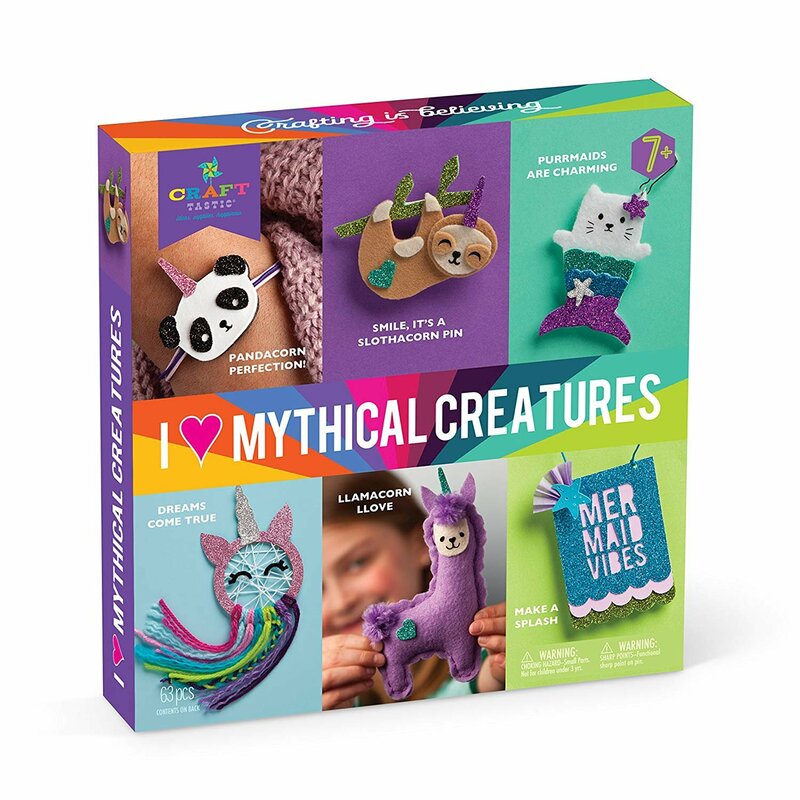 CREATE SIX MYTHICAL CREATURE ITEMS: Bright and colorful arts and crafts set makes 6 mythical creature projects to wear or display: A pandacorn bracelet, a slothacorn pin, a purrmaid backpack charm, a unicorn dream catcher, a llamacorn stuffie, and a mermaid banner. GREAT GIFT FOR AGES 8 AND ABOVE: Kids ages 8+ who are fascinated by mythical and magical creatures will love this Craft-tastic arts and crafts set. Search no more for a gift that will stimulate imaginations while teaching crafting skills, this is it! FUN TO MAKE AND SHOW OFF: Making this trendy and cute Craft-tastic craft requires a little patience, but should be easy enough for anyone who has done arts and crafts before. When done, they will have something wonderful to believe in and share with family and friends. ENCOURAGES LEARNING AND CREATIVITY: A variety of project types provides plenty of practice learning new crafting skills. ALL-INCLUSIVE IS NOT A MYTH: No mysteries here, the 64-piece Craft-tastic I Love Mythical Creatures kit includes everything to complete all 6 projects: 20 pieces of foam, 8 pieces of cardstock, 1 piece of tissue paper, 6 yards of cotton thread, 1 piece of chipboard, 10 yards of acrylic yarn, 16 pieces of felt, 2 yards of elastic, 1 metal pin, 1 metal ring, 1 metal clasp, 12 oz of polyester stuffing, 1 piece of adhesive, and detailed directions.